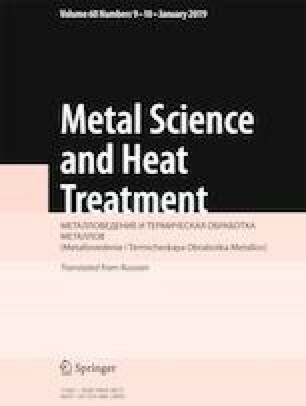 High-strength coatings deposited on billets of titanium alloy VT1-0 by the method of electron-beam melting of a mixture of boron carbide, titanium and fluorine flux powders are studied. Metallographic and x-ray diffraction analyses and wear tests of specimens with modified layers are performed, and the microhardness of the coatings is determined. The microhardness of the surface and the wear resistance of alloy VT1-0 grow considerably after the deposition of coatings from a powder mixture with 30% boron carbide. Translated from Metallovedenie i Termicheskaya Obrabotka Metallov, No. 10, pp. 30 – 35, October, 2018. The work has been performed at the Novosibirsk State Technical University with financial support of the Ministry of Education and Science of the Russian Federation within implementation of a complex project on creation of high-technology production (Agreement No. 02.G25.31.0144 of 01.12.2015).